Anyone lucky enough to be invited over for lunch with postdoctoral fellow Fatma Zehra Yildiz of Victoria D’Souza’s lab should accept immediately. Whoever does will be treated to delicious, homemade, traditional Turkish food, with portions so large they will be pressed to take some home. Yildiz learned her culinary skills growing up in Istanbul, Turkey, where her father worked as a professor of Naval Architecture and Marine Engineering. It was her father who inspired her to think about a career in academia, though her own circuitous route would bring her to structural biology and research on retroviruses instead of engineering. She says while at high school, she did not fit in with the popular kids, but instead put all her energy into studying as a quiet student. The benefit of her hard work was a high enough score on her national university entrance exam to get into faculty of pharmacy at Istanbul University right after high school, at a time when there were only seven universities with faculty of pharmacy in Turkey. However, her rebellious streak in certain areas affected her relations with professors. Yildiz admits that while wearing a headscarf was not essential to her way of life, the idea of being barred from doing something that she had freely chosen to do went against her nature. Looking back she says she is not sure If she made the best decision to fight against university policies, but at the time she could not reconcile herself to their standards. She decided to take a year off from college, and attended street protests almost the entire year, hoping that the situation would improve. Unfortunately, it got worse, and her father encouraged her to go back to college. Yildiz’s studiousness failed to impress the graduate administrators in Turkey, who were still hung up on her appearance. At that time her friend, who would later become her husband, was a graduate student in California, and he encouraged her to apply to grad schools in the U.S. She was accepted to the University of Maryland, Baltimore County, where she eventually began working in the laboratory of biochemist Michael Summers, an HHMI investigator working on the structural biology of retroviruses. During her graduate work, Yildiz focused on how retroviruses specifically recognize and package their genetic material during one of the late stages of retroviral infection, using bovine leukemia virus (BLV) – a model for HTLV-induced leukemogenesis in humans. Some of these findings were published in the journal Virus Research in 2013, and the rest of her findings are to be submitted soon. But when she came to Harvard and began working in the D’Souza lab, her focus shifted from a late stage of the retrovirus life cycle to reverse transcription initiation, an early phase event. Reverse transcription is the hallmark of the retroviridae family, and its initiation is highly specific. The work had been started in the lab by D’Souza’s former student Sarah Miller. Miller and D’Souza’s submission to Nature had been returned with revisions asking for a lot more experiments, but since Miller had already left Harvard, Yildiz was asked to finish the work. It took Yildiz over two years to finish the rest of the work, and their findings were finally published in Nature: Letters in November 2014. In this work, the authors showed the first structure-based mechanism for tRNA and retroviral RNA remodeling by providing detailed structural views of the two RNAs as they were being remodeled by murine leukemia virus (MLV) NC proteins. This turned out to be an elegant new mechanism for RNA remodeling that is distinct from the mechanisms utilized by other known RNA chaperones and remodelers. The goal of Yildiz’s current project is to solve the structure of the reverse transcription initiation RNA complex of HIV-1, and to elucidate its features that are specifically recognized by the reverse transcriptase enzyme. Traditionally, anti-HIV drugs, like protease inhibitors, have targeted viral enzymes in order to slow the progression of the disease, eventually disrupting the life cycle at certain points where these viral proteins play critical roles. However, the adaptability of the virus has limited the effectiveness of this approach. 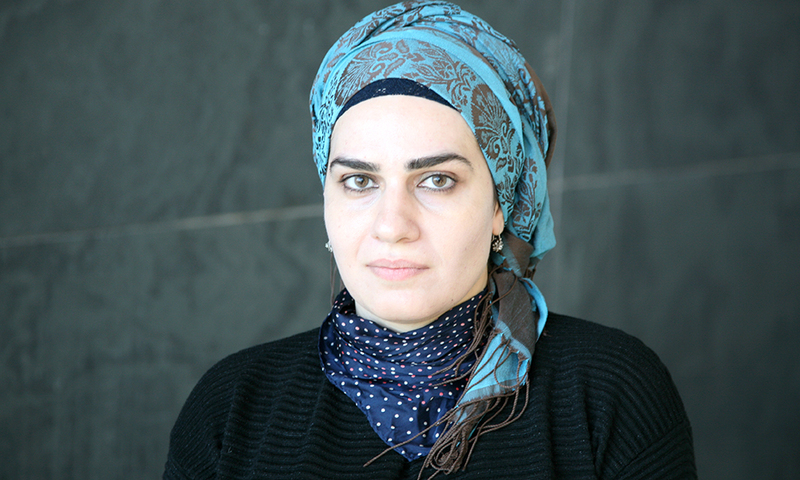 Yildiz is one researcher whose work could eventually contribute to a different strategy: targeting the viral RNA-protein complexes. Yildiz considers herself very lucky that she has hit upon an area of research she absolutely loves. She says that although she would certainly love to find treatments for retroviral diseases, her real motivations are simply her love of science and her gratitude toward the PIs who influenced her and celebrated diversity in their labs. She also feels a responsibility for passing her knowledge to the next generation. As soon as her paper is accepted, Yildiz will begin applying for positions in the U.S. and Europe.